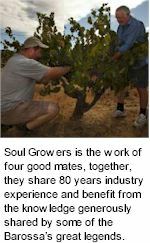 Soul Growers are about the soul of Barossa Valley, the history of vineyards and families of growers, the handing down of knowledge from the generations and establishing a winemaking style for generations to come. Soul Growers logo encapsulates these principles, the older generation working with the younger generation over a historic bush vine. Soul Growers vineyards and source growers are the soul of the Barossa. Many are living history, to be preserved for generations to come. The goal is very simple, to preserve the essence of Barossa Valley and it's vineyards, to capture and present them in each bottle of Soul Growers wine. All fruit is sourced from estate vineyards as well as a select group of growers that represent a vast array of terroir and Barossa sub regions, from vines aged up to 125 years. Sourcing fruit from across the Barossa Valley floor and out to the high country of the eastern ranges of Eden Valley, means the wines reflect the layers of flavour you would expect when these sub regions unite, achieving depth, richness and complexity. Soul Growers own and operate vines on Radford Road at Seppeltsfield, planted to Shiraz, Cabernet Sauvignon, Grenache, Mourvedre, Black Muscat and Chardonnay. Three and a half acres on Krondorf Road at Tanunda are planted to Grenache 30 years old. A half acre on Langmeil Road at Tanunda is planted to Shiraz, while a precious quarter acre on Kalimna Rd at Nuriootpa grows 106 Mourvedre vines 130+ years old. The source growers are an integral part of the wine style, without their expertise and careful attention to detail in delivering the very best grapes each year, Soul Growers could not produce the calibre of wine. To put it simply any great wine starts with great fruit, no amount of winemaking can significantly improve the quality. The job is really about preservation of the individual vineyard's flavour characters. The winemaking is all hands on, using traditional techniques with minimal handling. Fruit is open fermented in small batches keeping every vineyard and grower separate, right through to oak maturation. Traditional and gentle basket presses are employed to extract juices from the skins and the wines are not fined or filtered, just pure Barossa wine! A large amount of one to four year old oak, predominantly French, with a small portion of new oak is utilized for most of the wines, matured for up to two years to fully integrate and bring out the best of vintage. This important stage prior to blending allows each vineyard to be kept separate, to fully realize the individual expression of each individual site. It also allows the grower to see how their fruit has translated into a wine, contributing towards further refinements for harvests of the very best fruit each year. Blending is one of the great joys of winemaking as well as one of the most tedious. Each barrel is tasted through the maturation process several times but when it comes to blending, the art is finding the best wine that suits the style and flavour profile. Dozens of individual samples are tasted to find the best barrels, each winemaker has a hand in developing the blends. Many options are considered then reworked and then reconsidered again culminating into the final blend. 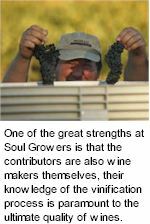 Soul Growers do have their fun during this stage, as they endeavour to produce wine that's good for the soul, good with food, family and mates, music and good cheer.